We recently posted a list of film festivals that feature works that align with our mission, and I began to think about the people behind the festivals, especially festival directors. I’m curious about their work, their passion and their commitment to this art form. A few years back, OC87: The Obsessive Compulsive, Major Depression, Bipolar, Asperger’s Movie screened at the Sprout Film Festival. It was a super affair, run by the energetic and enthusiastic Anthony Di Salvo. I called Anthony up recently to talk about his experiences with the Sprout Film Festival, and found out that Sprout is more — much more — than a once-a-year film festival. Here’s the interview. Glenn Holsten: Hello Anthony, how are you sir? Anthony Di Salvo: Good, thanks. Glenn Holsten: Would you start off by telling me how Sprout got started? Anthony Di Salvo: Sure, well there’s Sprout, and then there’s the Sprout Film Festival. Glenn Holsten: Really? What is the difference between the two? Anthony Di Salvo: OK, in 1979 I started a non-profit here in New York City, and I called it Sprout. And basically what we did then, and still do now, is provide vacations for people with developmental disabilities. Glenn Holsten: Oh, I had no idea. Anthony Di Salvo: Yes. Ten or eleven participants and three sprout leaders, and they go on vacations all over the world. 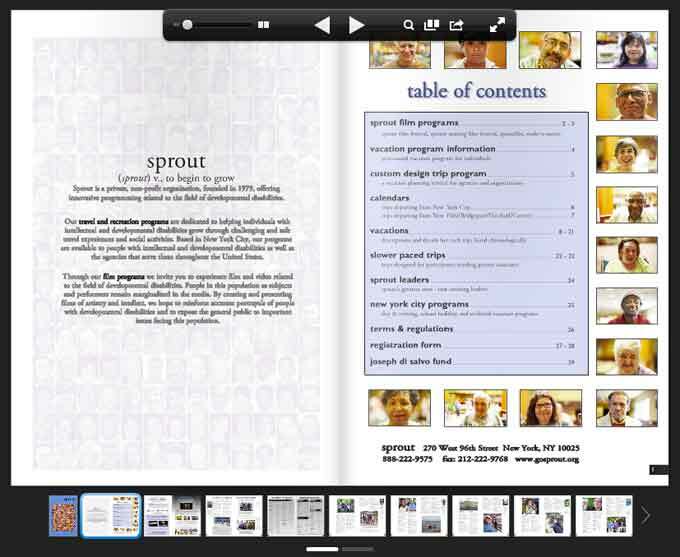 Anthony Di Salvo: Yes, that’s the big program that Sprout runs, and it’s grown to a really nice size. We’re busy all year round. The summer is extremely busy, and we just have groups going to all different vacations around the world. Anthony Di Salvo: Thank you. And the basic concept was the first 10 people that signed up would make up the cast. I had a film crew from NYU. I went along on the trip, we went away for five days, wrote a little script, we shot a movie, and then all the participants got a copy of it – back then it was VHS – and they get a chance to be in a movie, which was very exciting for them. And it was a very exciting trip. Then I ran it again the next year, and it got even more exciting, and we started getting a following, and then I started taking over and I started making the films every year since then. I wasn’t too thrilled with the NYU crew. While they were really good at the technical aspects of making the film, they didn’t have any of the interpersonal skills needed to work with the actors being that the actors were all people with developmental disabilities. I always felt from watching it that they could be getting a lot more from them, but they didn’t know how to interact. So from watching it I thought, “Well, shooting a film isn’t that difficult, as long as you have good relationships,” so I jumped in and I started making a film every year since then. Glenn Holsten: You just have to take the time to know people. You have to spend time with people. The sensitivity has to be there, but also the comfort level and the trust has to be there. Anthony Di Salvo: They had good intentions, the NYU crew, but just as an example, when we would stop for lunch they would sit at a different table. They wouldn’t sit at the table with the actors and the rest of us. You want their trust. You want to know that you’re not going to be taken advantage of. You want them to give the best performance that they could, you know, give. All this good stuff. And it was exciting for me, cause I had no intention of being a filmmaker, I had never made a film before and then I’m 45, 46 [years old] or whatever I was at the time, and all of a sudden I decide to start making films which has been very exciting. It’s maybe the most exciting challenging thing I’ve ever done. 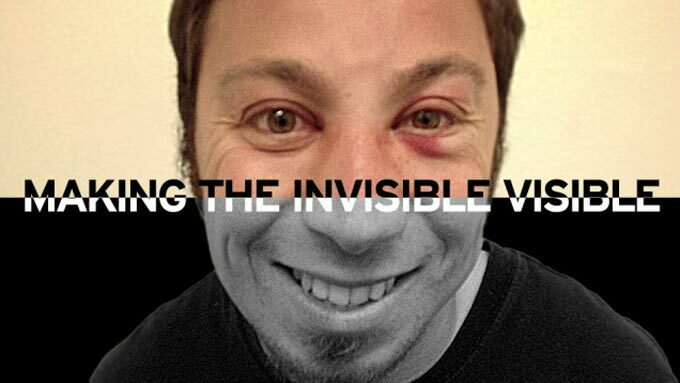 SPROUT MAKE A MOVIESince 1994 Anthony Di Salvo and cinematographer Ezra Waltermaurer have turned cameras on people with developmental disabilities for a variety of fun, poignant and touching films. Typically marginalized by their absence in film and video, participants are excited by this newfound opportunity to explore their artistic side. They have inspired and at times co-written stories that became Sprout films. They work hard to learn their roles and are given the support to reach their potential as actors. Creative benefits of role-playing are myriad, while the boost in self-esteem is invaluable. Anthony Di Salvo: Then we started showing the films around and we started getting a nice following, and then I started thinking, “Well, what other films are out there that feature people with developmental disabilities?” and I started investigating and I started to find some amazing films that really nobody knew about but were great! So in 2003, I formed a selection committee and had a call for entries – it was mostly me searching for films, because we have such a small niche, you know? The film has to showcase people with intellectual disabilities, it’s not just a call for entries. It has to be more of me searching for films. But that’s what I did. The selection committee decided on which films and in 2003 we had our first Sprout Film Festival in New York City. But a really nice thing that happened was agencies across the United States and Canada started contacting me asking me to bring the film festival to them. So in 2006, I started the Sprout Touring Film Festival. Where we actually go to all different cities around the United States and we show these films and the agencies get the people to attend and it’s been a great way to get the films out there and to be seen by more and more people. 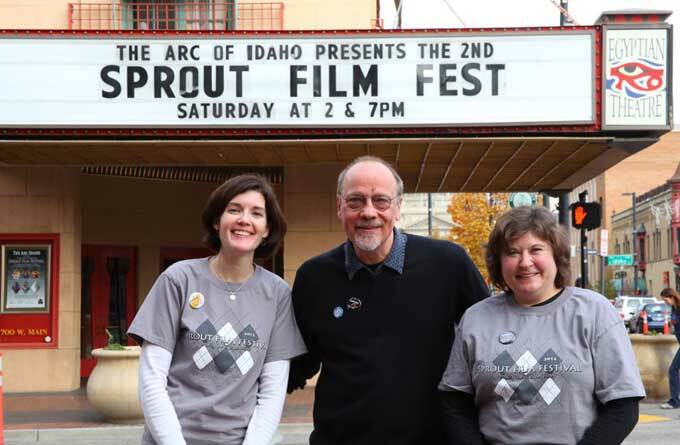 Anthony Di Salvo with Nicole Lang, Director of Programs, and Lisa Cahill, Executive Director, of The Arc of Idaho at The Arc & Sprout Film Festival in Boise, Idaho. Anthony Di Salvo: And then in 2001, we started our own distribution company where we sell the films for institutional use to be used in schools, and for agencies to train their staff and all of that. Because, as you know, film is a powerful tool, and it’s not being utilized especially in this field. So I want to get the films out there to be seen and to be used. Glenn Holsten: What was your original connection to this community? What was the impetus to start the whole thing? Anthony Di Salvo: I had no interaction with this community. I had never spoken with a person with a developmental disability. I was actually a little uncomfortable when I was around them, and usually when I was on a subway in New York City, I was always a little uncomfortable. I started Sprout because in my job before I was training people to work with small groups, mainly teenagers on backpacking groups, canoeing trips, bicycling trips, things of that sort. And I started realizing the importance of leaders — the people that lead the group. The better the person is, the more caring and giving the person is, the better the experience is for the people involved. So, I proposed to the agency that I was working with, “Let’s start working with other populations besides teenagers. Let’s work with emotionally disturbed people and people in drug rehab and all these other things.” They weren’t interested. So, being young and idealistic and foolish, I quit, and I decided to start Sprout. And I said “Sure, let’s give it a try.” And I just jumped in without any experience. And it just blew me away because I just fell in love with the population and I fell in love with working in that field. Anthony Di Salvo: It was exciting because when I started in 79, all the institutions in the area were just closing down — in 74 and 75, we had Willowbrook and all of that — and people were coming back into the community. It wasn’t something that I planned, it was something that was coincidence. So all of a sudden, all of these people who had spent decades in institutions were coming with us to, you know, whale watching and Lake George and Disneyland, and all this! So it was a very exciting time and the program just grew and grew. And the interesting thing is I still base the philosophy of leadership that we have here on that. That we really don’t look for people with a lot of experience, because sometimes they’re burnt out. They’re not going to be excited about going away for five days with them on a vacation if they work with them all the time. Whereas the people that we go after, they are just excited and want to work with the population and are sometimes just as excited as the participants are going on these vacations and that’s basically what we’ve based our philosophy on. It’s more of – as long as you have a big heart, and you’re willing to give a lot of yourself, and you’re excited about it and you’re a caring person, nice things will happen. I guess we’ve been proven right. It’s our 36th year we’re going into now, so things are going well. Glenn Holsten: Do you think there’s been an increase in films of this kind of subject matter? Have you seen a growth from the time that you started the festival? Anthony Di Salvo: There is, especially with autism and Asperger’s. It’s obviously a booming topic these days, unfortunately, and I’ve seen a lot of personal films from filmmakers whose children have these diagnoses. The interesting thing is that I’m noticing, though, is that there are less American films submitted, films being made in the United States. More and more foreign films are being submitted. It seems like the other countries have a little bit better advantage as far as funding sources than we do here in the United States. I don’t think film is that big of a topic here for our government to fund, whereas in other countries, it seems as they do have money. So we’re getting a lot of Australian films, and a lot of European films. But the United States films seem to be a bit on the decrease. That’s why I’m really excited about Sproutflix. Because when we sell films to universities and agencies and all that, half of the money goes back to the filmmakers. Anthony Di Salvo: Being a filmmaker, you know it’s not the biggest money making operation. So to give them some money back is just so wonderful and the filmmakers deserve it. They put their heart into these films and it’s nice to give them some money back. I’m also hoping that it might give them some incentive to make more films about the field. SPROUTFLIXThe only distributor of films specifically and exclusively related to the field of intellectual and developmental disabilities. Sproutflix offers streams, downloads, DVDs and playlists to be purchased and licensed for institutional use. We believe film can inspire, inform, and affect change. It is a powerful educational tool and the perfect addition to any curriculum or training program. We encourage universities, libraries, agencies and other training and educational facilities to browse our ever-growing collection of titles. Glenn Holsten: What kind of film wows you? What surprises you? Anthony Di Salvo: I look for two different kinds of films. One is a film that features actors with developmental disabilities. Like your film [OC87] had some sequences in it where Buddy was acting. I love that kind of stuff, ‘cause it’s not seen enough. And sometimes we get submissions where the character may have a developmental disability, but the actor doesn’t. And we never show those films. That is one of the guidelines that I’ve given is that we will never show a film that has an actor portraying a character that has a developmental disability if the actor is not developmentally disabled themselves. So it’s nice that the rare times that we do get narratives where they are actually using actors with disabilities. And also, I’m excited about films that will get the people “outside the choir” to see it. Which is a hard thing to do. You know, they just have a block. They have it in their mind that it’s going to be sad or boring or whatever, and it’s hard to get those people. So whenever we get a film that I say, “OK this can crossover,” I’m excited about those. And then sometimes I’m let down. In fact there was a film that we showed last year called The Punk Syndrome. It’s from Norway, and it’s about a Norwegian punk rock band – four members, all of whom have developmental disabilities. Wonderful film. Funny. It has a lot of messages in it, and it’s interspersed with this heavy punk music performed by four musicians with developmental disabilities. It was just a great film. But the turnout was very low. And we couldn’t get people to come, which is hard. It’s a hard sell. You know, sometimes I do better when I tour in other cities. New York City is just a lot of burnt out people that have thousands of things to pick from everyday to do so sometimes it’s a little rough to get them to come to our festival. But then when I tour they get much better turnouts. So those are the films that I really try to find. Narratives and films that I think will appeal to people outside the choir. Glenn Holsten: As a filmmaker I’ve really enjoyed presenting at conferences and at small screenings. I once showed a documentary in a small theater in a strip mall in Cleveland, and it was the best, because those audiences are hungry for the message, and the films are being used in a way that does service to the energy you and your whole team put into them. Anthony Di Salvo: We switched venues, by the way. You were at the museum when we were at the museum in the small screening rooms. Glenn Holsten: Right. It was lovely, though. Anthony Di Salvo: Now we are at the SVA [School of Visual Arts] theater, which has a 500-seat theater and a 300-seat theater. So it’s a whole different feel. Now it feels like a big film festival, which is very exciting. Glenn Holsten: So Sprout is a giant endeavor. What keeps you going? It must be overwhelming at times. Anthony Di Salvo: Oh, I just love it. I’m lucky. Look at what I do — I run festivals, I go around to different cities presenting films I make films. You know, not a bad job. What I’m doing everyday is a lot of fun. And you get the reaction of the people when they see these films. They have no idea that these films exist. I’ll be touring to agencies that have many of their staff there [who] had no idea that these films existed. They just blow them away. Because they are very impactful. They are very emotional, very personal. And to see the reaction of the audience when they see these films. And people with developmental disabilities in the audience see actors up on the screen that have Down’s syndrome and autism, it’s so self empowering. It’s just all so positive. Click the photo to follow a link to a thoughtful review of the Sprout Film Festival posted on Gawker in 2012, the year “OC87” screened at the festival. Glenn Holsten: I am reminded of an early OC87 screening in Pennsylvania at a conference for consumers of mental health service agencies. After the screening, a man who related to the film in a big way approached me and said, “You gave my story the ‘red carpet treatment.’” That was very touching. Anthony Di Salvo: And where else would that happen? There’s no place else. The films that you’ve made and the films that we show are so important. And the only thing that’s frustrating to me is that they are not being utilized enough. They should be seen more, they should be seen on TV more, they should be seen in the movie theaters more, they should be used more for educational purposes in schools. Glenn Holsten: What’s the goal? Anthony Di Salvo: The goal? To get more films made, get more people to see the films, get more people to use the films . . . there’s a long way to go. We’re just touching the surface here. There’s way, way more to do, more to achieve. We’re just starting, so it’s exciting. Glenn Holsten: Are any of the films that you made available for screening? Anthony Di Salvo: Yeah, if you go to sproutflix.org — that’s where we sell our films — one of the dropdowns on the side, like the themes, (autism, Down’s syndrome, etc.) one is Sprout Make a Movie. I made all those movies, so it will be a listing of a bunch. I made a bunch of films. And that’s the one thing I have to change, I’m so busy going around — which is very exciting — showing the films, but I miss making films. So I’m trying to change my schedule around now so that I get time to making more films. Glenn Holsten: That’s great, I think you should. Anthony Di Salvo: For the Sprout Film Festival, we have all our films coming in, so I have the opportunity to watch all the films, which is a great learning experience. Just to see what’s going on out there, what makes the film good, what’s holding the selection committee’s attention, what’s making them lose their attention, you know? A great lesson in filmmaking is just watching these films and watching how the selection committee reacts. Glenn Holsten: I’m grateful for your time. I applaud you’re efforts. I’m glad you’re in the world doing this. The 12th Annual Sprout Film Festival will take place May 31 – June 1, 2014 at the School of Visual Arts (SVA) Theatre in New York City on 333 West 23rd Street. Please visit this link to learn more. Interview with Rachel Kunstadt about Sing Away The Stigma, a musical theater event that uses real people's journeys with mental health as inspiration.